Virtually everyone aged 55 or older suffers from osteoarthritis of the hand or wrist. That being said, about 80% of people hardly notice the natural wear and tear in their joints. The remaining 20% do have symptoms. The joints in their hand or wrist become stiff and hurt when they move. Osteoarthritis of the hand mainly affects the upper joints of the fingers and the basal joint of the thumb. 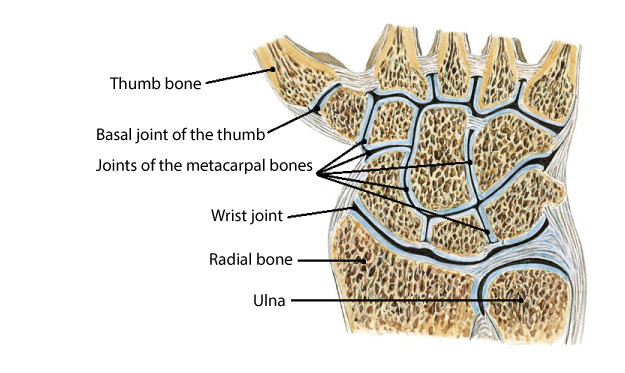 Just like most other joints in the body, the ends of the bones of the finger joints are covered with a layer of cartilage, which ensures that the two bone parts smoothly slide over each other. Arthritis of the hand is caused by wear and tear in this cartilage layer, causing the smooth surface to become coarse and irregular. This wear and tear is part of the natural ageing process, but it can also be caused by long-term overloading of the hand joints, by injuries to the hand joints or by auto-immune diseases, such as rheumatoid arthritis. The latter is a condition where the immune system sees the cartilage cells as foreign bodies and therefore attacks and damages them. 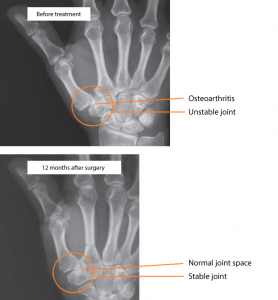 What are the symptoms of arthritis of the hand? The main symptoms of arthritis of the hand are stiff and painful joints, which may worsen when the joints are strained or overloaded. The joints generally feel more painful and stiff in the morning, when getting up. This is called ‘start-up pain’ and usually decreases within half an hour. Wear and tear in the cartilage often goes hand in hand with inflammatory reactions. In this case, the body forms additional bone tissue along the affected joints. These protruding bones are very visible and patients’ fingers therefore often look ‘knobbly’. They cannot stretch their fingers entirely and also report a loss of strength in their fingers. The thumb is the most frequently used part of the hand, making it very susceptible to wear and tear. 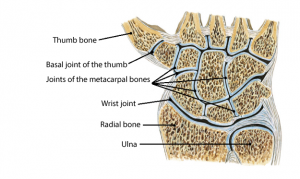 Osteoarthritis mainly affects the basal joint of the thumb, which consists of the first metacarpal and the trapezium bone in the wrist. The main symptom of arthritis in the basal joint of the thumb is a nagging pain at the base of the thumb. This pain tends to increase when the patient makes a pinching movement, for example to open a cap or lock. Writing can also make matters worse. 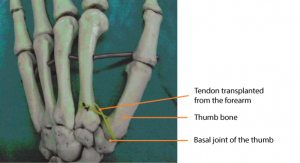 Osteoarthritis in the basal joint of the thumb is more common among women than among men. Unfortunately there is no medication to treat arthrosis. Keeping the hands warm can soothe the pain and reduce stiffness. Regularly soaking the hands in warm water or wearing rheumatoid arthritis gloves made from synthetic rubber can help. These gloves keep the hands warm and exert mild pressure on the finger joints, which reduces the pain. These gloves are fingerless, allowing users to use their hands freely. 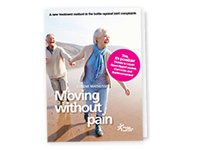 Paracetamol can ease joint pain as well, but it is not a real anti-inflammatory. To reduce inflammation, physicians prescribe non-steroidal anti-inflammatory drugs (NSAIDs), such as diclofenac, ibuprofen or naproxen, which often have nasty side effects. A natural alternative is a liquid combination of Green-lipped mussel and Curcumin, which also reduces inflammation in the joints, but without any of the nasty side effects. 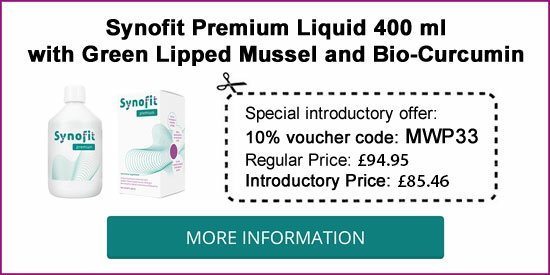 For more information on this liquid treatment head to your drugstore, health shop or pharmacy, or try a Google search. Acupuncture can help reduce inflammation and ease pain, as shown in various studies into the effect of acupuncture on the peripheral joints, which include the hand joints. In case of beginning arthritis the physician will do his utmost to treat the wear and tear without surgery by easing the pain and reducing the inflammation, and by slowing down the wear-and-tear process. This can be done by prescribing anti-inflammatories or by administering a cortisone injection in the joint. As mentioned above, these medicinal anti-inflammatories have the disadvantage of causing nasty side effects. User research shows that in almost 70% of cases, a liquid combination of Green-lipped mussel and Curcumin, two natural anti-inflammatories, offers the exact same benefits within 80 days. To date, no side effects have been reported with the use of such products (exception: allergy to molluscs). Patients suffering from osteoarthritis of the thumb can also benefit from using a support brace, i.e. a strong plastic bandage that relieves pressure on the thumb, reducing pain, as well as wear and tear. In more serious cases, the physician can opt for several surgical procedures, which all focus on removing the affected cartilage and bone. Sometimes small bones are also joined (arthrodesis) to avoid further painful movement of the joint. The disadvantage of this surgical procedure is that the joint cannot be moved anymore, which can affect daily activities. Currently, a new treatment method is being developed for osteoarthritis of the thumb, with support from a Dutch Arthritis Association (Reumafonds). This new method is called joint distraction and it has already proven very successful in the treatment of osteoarthritis of the knee. When treating the latter through this technique, an external distractor is generally used to keep the joint apart for a few weeks. For the thumb, a different technique is used (this is particularly useful if the joint is also unstable): a tendon is transplanted from the forearm, and the base of the index finger is joined to the base of the thumb, keeping the thumb bone away from the adjoining bone (see image above) . At the same time, joint instability is corrected because the thumb bone is properly joined to the other bones of the hand. This procedure gives the injured cartilage the necessary space to repair itself, and even stimulates it to do so, because the distraction reduces the inflammation  and pain, and promotes mobility. The results of this treatment can easily be seen on an X-ray . Bear in mind though, that since this is still an experimental technique, it cannot be carried out through the regular healthcare system yet. Regular exercise maintains joint suppleness. Below you will find an exercise programme that aims to strengthen the muscles and promotes mobility of the hands and wrists. You should do three sets of each exercise, with a 30-second break after each set. Good luck! Sit at table. Place your forearms on the table top, with your palms down. Then lift your hands, but keep your forearms on the table. Count to three, then lower your hands. Sit at table. Place your forearms on the table top, with your palms down. Make a fist with each phalange, starting at the top. Count to three, then open your fingers. Make sure you do not strain your fingers during this exercise. Sit next to a table. Place your arm on the table top, with your hand hanging over the edge. Make a fist without squeezing and move your hand up. Count to three. Once you have done a set of three repeat this exercise with the other hand. Sit at table. Place your hands on the table top, with your palms up. Press the tip of your thumb against the tip of your other fingers, one by one. Do not strain. Sit at table. Rest your elbows on the table top and press the palms of your hands together. Slide your elbows open as far as possible while keeping your palms pressed together.